Is this somehting to do with a leading edge making contact first to reduce squeal? 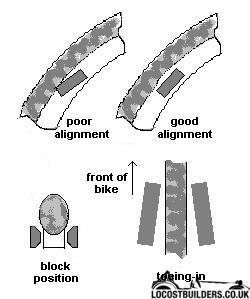 Perhaps not - but i'm thinking of bicycle brake blocks where they are best aligned so that the front of the block contacts the rim first. When setting bicycle rim brakes up you set them up with a slight toe in to prevent them squealing and improve brake performance. I usually use a thin bit of card between the rim and the rear edge of the brake pad to get the toe in (if that makes sense). Are the 2 "halves" of the callipers linked (most seem to be) as originally each half (top/bottom) would have seperate feeds off a dual master cylinder. But assuming yours are linked, they should all work at the same time. Not being rude here, but lack of use causes havoc with brakes. You may just need to pump the pistons in and out a few/many times to ease them all off. It sounds like the NS pistons may be slow to move? And perhaps a bit sticky? I think the piston with the least resistance would just move first till it ran out of travel or found more resistance and then the next one would move and so on, it's very unlikely all the piston frictions would be so perfectly matched for them to move at the same time. Once the pads are in the movement is very small so they will move almost at the same time. It's more likely you have contamination on ether a pad or disk or that one or more of the pistons is jamming. Have you ever had the car properly corner-weighted? A significant imbalance will cause premature locking on one corner. Some interesting replies, thanks guys! But also, I will check to see what the ns is doing, and similar, and also check the leading edge on all the pads are chamfered to give equal lead in time, this is also a possibility ! Definitely a seized piston or at least 1 with more friction than the other. Without any restrictions in the the pistons brake fluid will exert the same pressure on all the pistons at the same time as it is a sealed system.